When Jamie contacted me about being a sponsor, I was beyond ecstatic. I adore her blog, and when I went and checked out her new shop that she wanted to promote here, I was just as excited. Jamie has great taste, so naturally all of the items in her store are adorable. She has everything from vintage vinyl, baby clothing, awesome dresses, housewares, and more. I'm excited for all of you to check out Shelby Black, and be sure to stop by her blog too (I love the playlist she just posted)! And don't miss the video below either- so, so cute. Happy shopping! shelby black. the carefully curated collection of the old, the beautiful...the dirty pretty things that sang to my heart, sang sweet and forlorn histories into my ear, placed their secrets in my hands. pieces that floated down to me like birds, begging to be loved and released. art and ideas that exploded from my chest in a blaze of glory, of thunder, of fire and lightning. notes tucked inside of little boxes, written with fingers stained in excess, tie dye kaleidoscopes soaked into the creases. pretty dresses, buckles and jewels. blankets and crystal, leather and lace. records and jewelry boxes, dishes for candy. treasure for baby, treasure for beloved, treasure for the gypsy living inside you. shelby black was a person, but she was not me. she was my muse, my songbird, my creatrix. she sang to the stars and the universe listened. she was a live wire, alive and burning with electricity. she made magic with her fingers, spun webs with her mind. men wanted to love her, women longed to be her, children begged her to sing them to sleep beneath the light of the moon. and one day she disappeared, pieces of her diffused into the world like light through shadowed water. and I search for her every day, find the things with her soul inside, create the things to call her back to me, a beacon in the dark. once found, once recognized, I unleash her on those who will cherish her most. 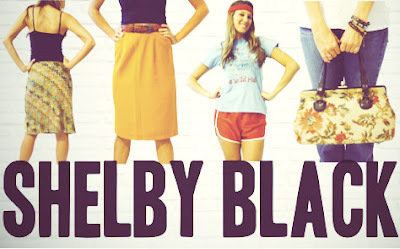 searching, hunting, finding, loving...an endless pursuit...the resurrection of shelby black. things that are old and forgotten, dirty and overlooked. things that bleed innocence, that elicit raw emotion. old houses and lonely trees. layers of fabric billowing in the breeze, contrasting patterns lit by the sun. spontaneity. dusty chandeliers. candles and incense and fans spinning on high...anything that has a story to tell. 3) If you could tell your 15-year old self anything, what would you tell her? hold tight. don't break. you haven't seen the worst of it, but when you do breathe deeply and sleep soundly. the storm will pass, it always does. no one will hand you happiness, waiting for the sun is a futile endeavor. find it. run fast and hard and don't stop until you do. **also, don't save text messages, that will most definitely get you in more trouble than you care to deal with. and maybe on house arrest. maybe. a pair of golden puppy eyes watching me closely, a handmade crucifix of warped wood and metal wrapped in barbed wire, a sleeping baby curled up on my lap, a peacock scarf hand-beaded in Turkey. 5) Is there anything you'd like new readers to know? she shines from Jamie Dunn on Vimeo. Woah! I love her shop! Best sponsor post ever. I love shelby black clothes.Its my favourate brand in clothes.